How egg-citing! 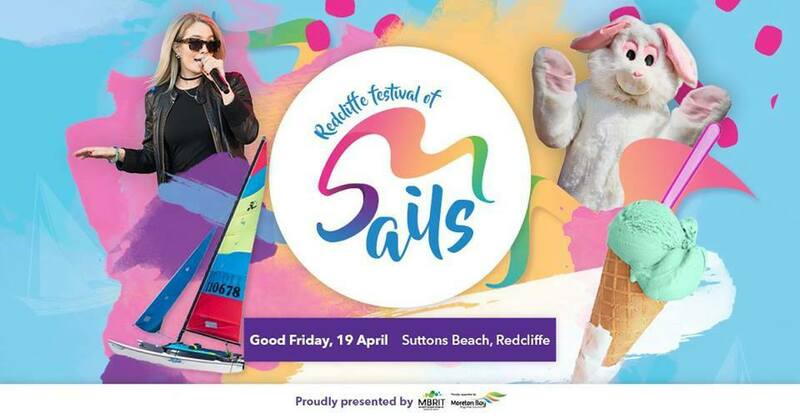 2019 is promising the biggest programme of bunny-licious entertainment ever at the 2019 Redcliffe Festival of Sails. A fabulous family event held on Good Friday at the seaside at Suttons Beach, the Redcliffe Festival of Sails has a whole day of FREE workshops and activities, an Easter egg hunt, rides and amusements planned and, of course, a visit from the very famous sky-diving Easter Bunny! All day on Good Friday at Suttons Beach in Redcliffe! Come along to the Redcliffe Festival of Sails where you are guaranteed the best waterfront views of the Brisbane to Gladstone Yacht Race - the second biggest yacht race in Australia. Suttons Beach will come alive with all day beach volleyball and activities. Make sure you're on the sand to be part of the fun! For a $1 donation children can join in the Easter Egg Hunt to help search for colourful Easter eggs. For only $7 kite flyers can create their very own kite at the Kite Making workshop. 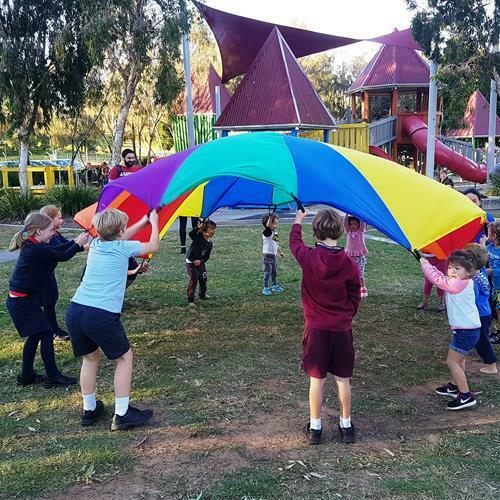 Be inspired by the Redcliffe Kite Club's fabulous kites as they fly them over Sutton Beach. 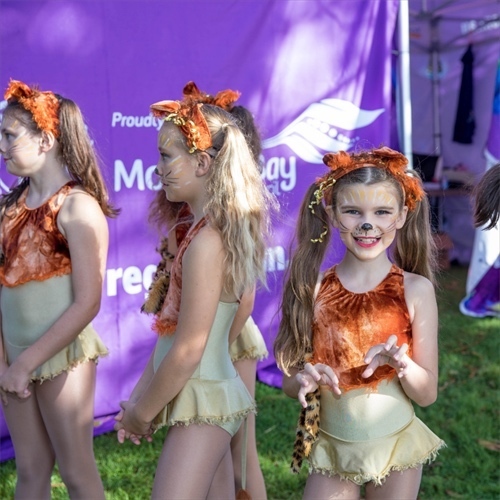 Join the Moreton Bay Regional Council Healthy and Active team as they deliver a number of fun and FREE activities throughout the day. 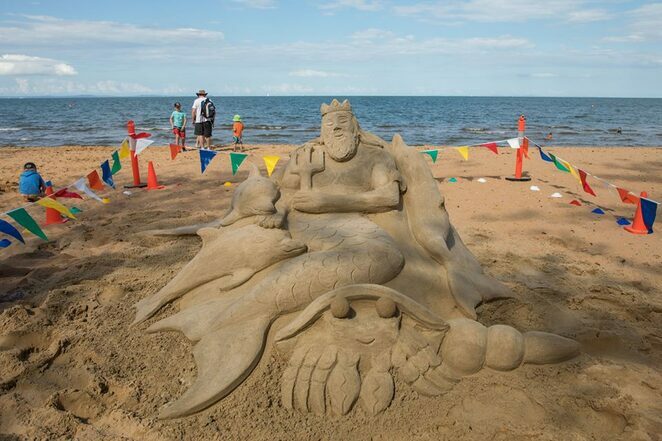 Watch on in awe as a professional sand sculptor creates magic with sand, designing masterpieces before your eyes. Spectators will have the opportunity to create their own works of art. The Brisbane to Gladstone Yacht Race is one of Australia's most significant and largest yacht races and in 2019 is actually celebrating it's 71st milestone - an achievement to 'rock the boats', for sure. This fabulous yacht race is an Easter weekend tradition in Queensland, attracting entrants from all around Australia and abroad, who set sail from Moreton Bay on Good Friday. Ice cream lovers rejoice! 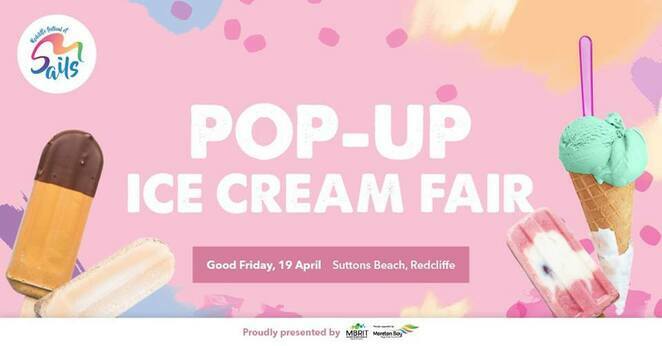 The Pop-up Ice Cream Fair is back on Good Friday as part of Redcliffe Festival of Sails. Dessert lovers have the opportunity to taste their way through everything sweet, creamy and frozen, setting taste buds a-dancing with the variety of gourmet desserts. The fabulous duo of Dan & Diletta will be ensuring dessert lovers get to enjoy a chill and festive atmosphere at the Pop-Up Ice Cream Fair. Dippin' Dots are ice cream beads made from fresh dairy ingredients that are flavoured with a variety of fun, fruity, enticing and sometimes exotic flavours. Dippin' Dots are frozen, almost instantly, in liquid nitrogen, locking in the delicious flavour and freshness. Make sure you taste the fun of Dippin' Dots at the Pop-Up Ice Cream Fair. Oh my gosh! Donut Kitchen have combined two deliciously decadent desserts, ice cream and donuts, and created an ice cream donut sandwich! Sounds divine! My most bunny-licious mobile coffee van, Espresso XO, will be organising your next caffeine hit at Redcliffe Festival of Sails. Whatever your coffee preference, hop along to Espresso XO, who will have you sorted in no time at all! One very special little van! 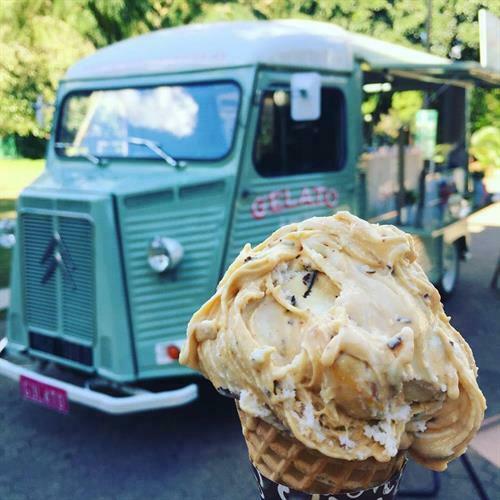 One very special little van will be serving up gelato and sorbet - ALL day! This delightful dessert is made fresh daily by Gelato a Go-Go, using quality local ingredients and Guernsey milk and cream. Sometimes we just feel like going back to basics i.e. a delicious vanilla ice cream with your choice of sprinkles, nuts, dipped in chocolate, layered with sherbet or with a Flake (my favourite!). Classic Ice Cream will also have a fabulous range of sundaes. Can ice cream really be fried and crispy? Or how about ice cream wrapped in torched marshmallows? Sounds ever so slightly eccentric, but if you're keen to find out, make sure you get along to IcePhile for their decadently, delicious ice cream tastes. Ungermann Brothers is the brain child of Master Chef Australia 2017 runner-up, Ben Ungermann and his brother, Danny, who strive for a totally natural ice-cream with no preservatives or artificial ingredients. And, the cherry on top? The ice cream is all made by hand. Made from coconut water for hydration, biofermented probiotics for gut and intestinal health and highly nutritious superfoods for maximum performance and energy, CocoWhip is completely free of dairy, soy and gluten and ... is 100% vegan friendly too! Yo-Get-It Frozen Yoghurt is 97% fat-free, gluten free, dairy free, high in protein and vegan friendly too. Create your own delish masterpiece - choose your flavour, then add your toppings for a healthy-as frozen yoghurt. Taste-explosive gelato sticks in various fruity and creamy flavours can be found at Popysyland. 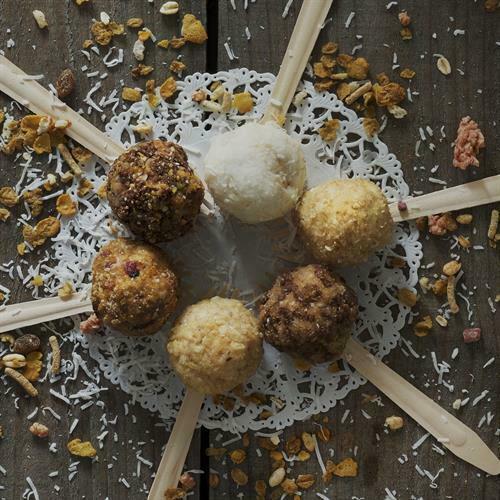 The fact that they're all natural flavours, dairy and gluten free, only adds to their appeal. Make some new furry and feathered friends at the Animal Farm, where children can hand feed, brush and pat all these wonderful animals. Has your child always wanted to sit behind a news desk to report on the 'big' stories of the day? 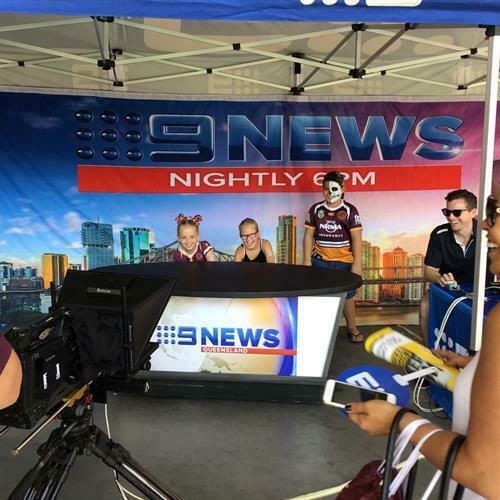 Well, Nine News are bringing their mini news desk to the Festival of Sails for mini newsreaders. 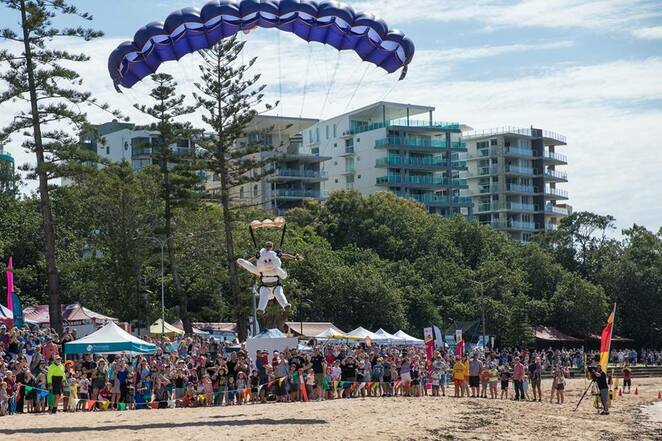 Great photo opportunity - don't forget to hashtag #redcliffefestivalofsails. Marc, the Joyologist, will be presenting an Eco Cartoon Colouring Mural with environmental themes and interactive community games, using recycled instruments, labomba drum-dance, rainbow parachute and face and body art. Life is much more fun with a painted face! For a small cost, children - and their parents - can have their face painted. FREE Craft Workshops will be on all day, make sure you get there early to grab a spot. How awesome is this! 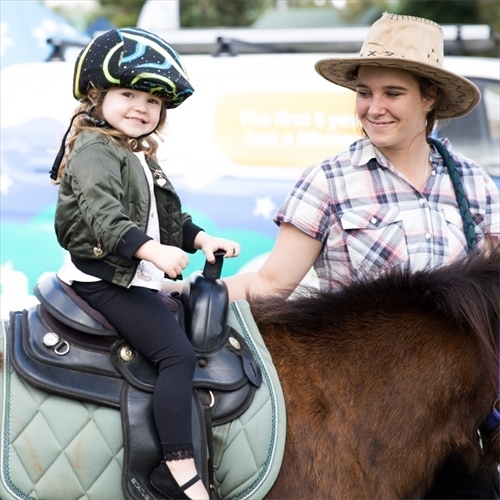 Pony rides for the littlies in the family - create memories whilst making little dreams come true! Thomas Armstrong-Robley is the host this year for the Redcliffe Festival of Sails and will bring his youthful energy and unique style to the entertainment at this special Good Friday event. Very talented dancers from JAM Performing Arts will be performing to audiences at 9.15am. Is it a bird? Is it a plane? No, sillies, it's the famous skydiving Easter Bunny! Keep your eyes peeled to the skies from 10am when the Easter Bunny will drop in with some chocolate treats for the children. Thanks to Skydive Australia for their support in producing a skydiving Easter Bunny. Please note the skydiving Easter Bunny is weather dependant. Is it a bird? Is it a plane? No ... it's the skydiving Easter Bunny! Mason Watts, an accomplished musician will be showing off his musical abilities on the Main Stage. Ruby Gilbert's style of singing is inspired by the grittiness of Johnny Cash. Raw and heart-breaking, Ruby's voice evokes an old-time feel, while her lyrics are very different. 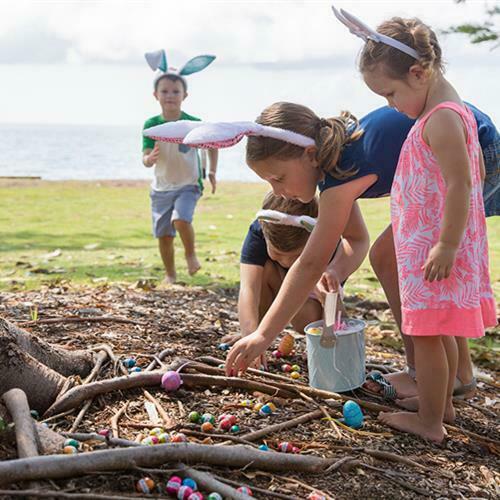 A fabulous Easter Bunny Show to celebrate Easter in the Moreton Bay Region. Enjoy some fantastic dance troops from the Sharon Alback Dance Centre when they perform Where is the Easter Bunny? A heap load of fun for the whole family. 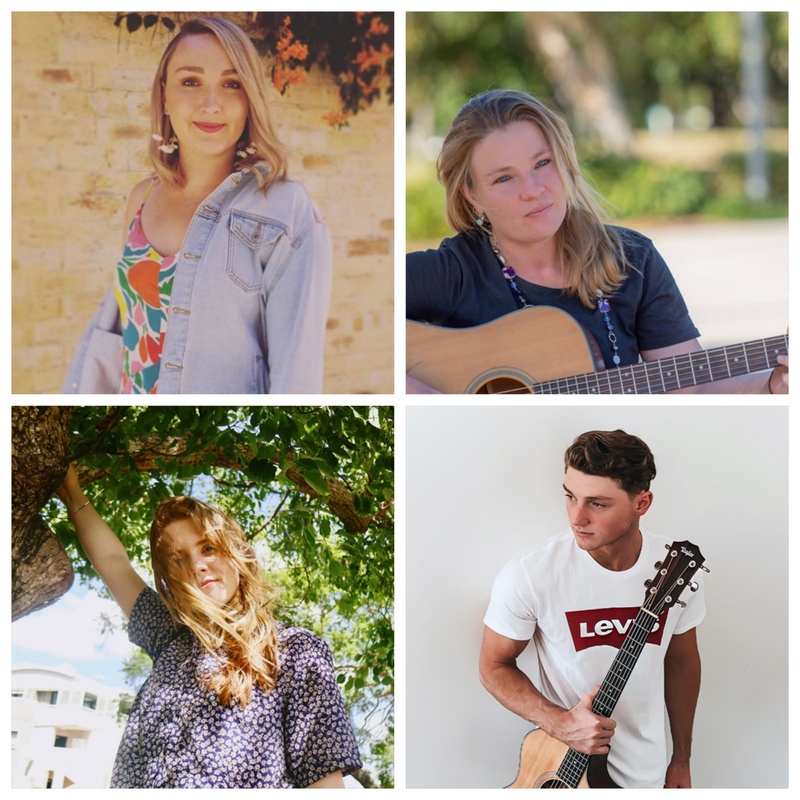 BALLANTYNE is a singer/songwriter based in Brisbane, who is currently working on recording her debut album. Watch BALLANTYNE perform on the Main Stage. Sit back, relax and enjoy a variety of rolling tunes from some amazing local musicians on the Northern Acoustic Stage. Amy Kate is an acoustic pop singer and multi-instrumentalist, who draws on pop and R & B influences. Catch her early at 9.15am. The crowds love Nicole with her raw sounds and ability to play a mix of originals and popular songs. One of our very own home-grown entertainers, Isack Hunt hails from the Sunshine Coast. Isack has already released his first EP, Bad Blood, which is gaining a lot of interest on Spotify and Apple Music Charts. Isack Hunt will be performing at 11.45am. Nicole McKinney is a folk singer/songwriter who captivates her audiences with her unique voice and timeless catchy melodies. Sarah Hamze is only 11 years old but has so much talent as a singer/songwriter she is the current titleholder of the Homestead Youth Talent Expo held in Caboolture. Jax Haze has crafted his own special brand of smooth, bluesy sounds and has successfully been captivating audiences with his soulful crooning for many years. Liam Johnson is an alternative folk musician who loves nothing more than singing heartfelt songs that take you on a journey of self-discovery and truth. Liam's debut single 'Amethyst' is due to be released in late October this year. Lucy Korts is a Brisbane based Indie Folk artist, with a very unique and distinctive vocal style. Graham Moes - of Reggae band, Fat Picnic fame - is a one-man unstoppable force of modern soul music. Experience Graham Moes' looping singularity just after lunch. With two foodcourts offering international cuisines from Hungary, Greece, Japan, Mexico and Italy, there will definitely be something for everyone in the family. Festival classics like spiral potatoes, wood-fired pizza, churros and fresh hot donuts, will also be available. Love Handmade Lane is a boutique-style market selling stunning, handmade with love, products. Handmade stalls will include Crochet and String; Manresa Design; Sew Sew Suzi; Cushion Mountain; Berry Good Jam and Chutney; The New Devine and The Yellow Gallery. Join in the FREE Easter Wreath Workshops in Love Handmade Lane - available from 10am to 2pm. 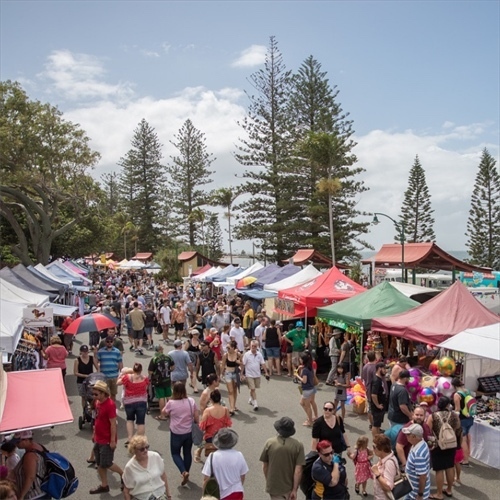 With more than one hundred and fifty market stalls lining Suttons Beach, shoppers will have a huge choice with offerings of handmade gifts, clothing, accessories, toys and treasures. Shopping heaven! Redcliffe Festival of Sails is featuring a full range of thrilling rides for young adventurers. 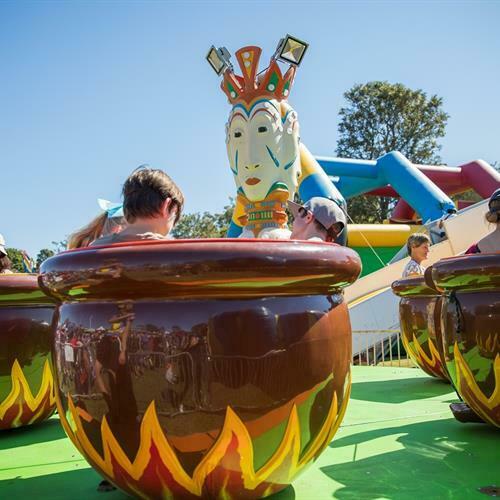 Get ready for some awesome ones including the Circus Jumping Castle, Cup and Saucer, Rock Wall, Ferris wheel, Bumble Bee Castle and much more. All day ride passes are only available until 3pm. 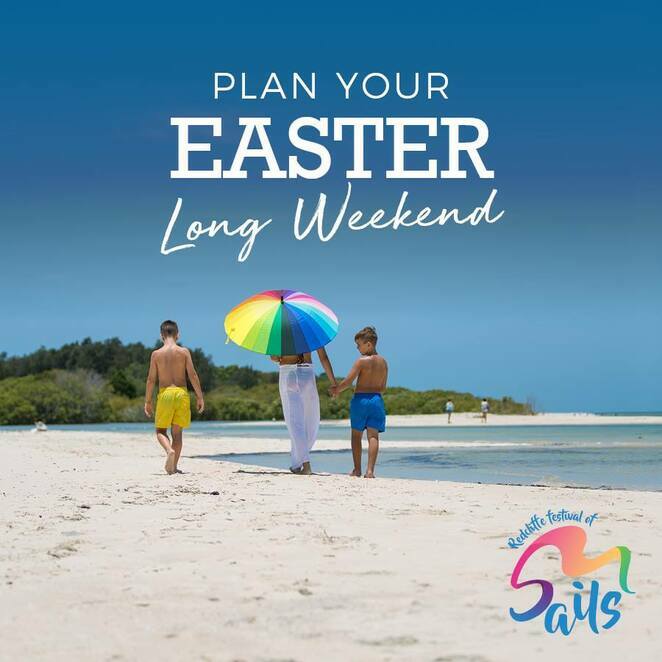 Now I'm no Easter eggs-pert, but I reckon if you bookmark Good Friday, 19 April, at Suttons Beach in Redcliffe, you are in for a fabulously sunny side-up day of entertainment, shopping and front row 'seats' to the Brisbane to Gladstone Yacht Race. Life certainly doesn't get better than this! For information on how to get to Redcliffe Festival of Sails, whether it's by car or train, please click here. I love this event Elaine. Thanks for such a comprehensive overview. What an incredible article Elaine! Congrats on the well deserved silver! The text effects are excellent, where can I find how to apply them?